1. The best and most convenient way to cruise the city is underground as its route runs though all significant landmarks and sights of the resort. Other city transports available in Palermo are buses and trams which feature a single type of tickets. The historical center of the city is better to be explored on foot as in this case tourists will get a chance to fully enjoy and embrace the beauty of local landmarks and attractions. 2. Taxi is one of the most in demand city transports even though charged rates are rather high. A cost of a trip should be negotiated in advance. An average cost of a trip up to 10km will be about 10USD. 3. Tourists should necessarily keep to the traditional rules of etiquette. Entering a public place one should necessarily greet everybody and leaving the place one should say good bye. Tourists may address local people for help, however any assistance needs to be rewarded. 4. Utility supplied voltage is 220V. Most of the hotels and inns are equipped with European standard sockets. Before a journey one should check all the appliances for compatibility and get necessary adapters and connectors. 6. Street call boxes offer the optimum rates for inter city and international calls. The boxes are set in all the main streets of the city as well as in close vicinity to public and entertaining establishments. For international calls one should choose a call box with a “TELESELEZIONE” sign. Such call boxes accept only special plastic cards or coins sold in all news stalls and tobacco shops. 7. Grocery stores and markets start working not later than 8am meanwhile other shopping centers and stores get open at 9am. Daily working hours may vary from one establishment to another. Small shops and boutiques close at 4 – 5pm meanwhile large shopping centers continue to work up to 20:00. 8. Prudent tourists should visit one of the open markets to buy foods as in this case the price of the goods will be up to 40% lower than in large stores. Shop-a-holics should pay specific attention to leather goods of local production as these feature ultimate quality. 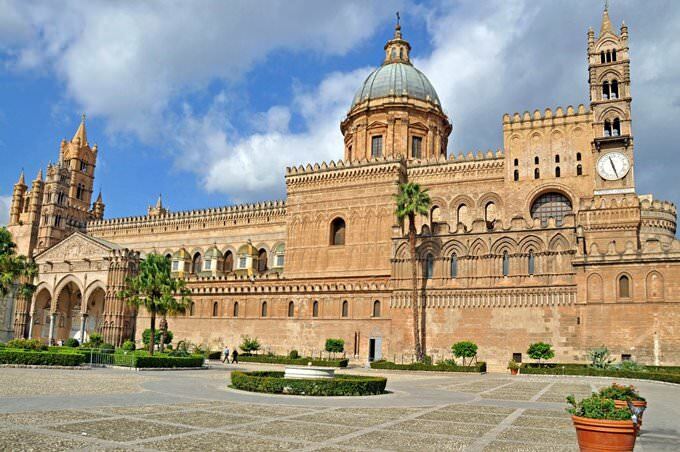 Preparing your trip to Palermo: advices & hints - things to do and to obey You can re-publish this content with mandatory attribution: direct and active hyperlink to www.orangesmile.com. 9. Italians are very sociable people. They will gladly show strayed tourist the way, tell them about local sights and give some advice. 10.When they say goodbye, Italians, even with new acquaintances, usually kiss their cheeks. This gesture is part of the culture of locals and has no additional meaning. 11. Italian language is considered one of the easiest to learn, and therefore before the trip you can learn a few phrases for ease of communication in markets and in stores. Travelling to Palermo - advices and tips. What should be provisioned in advance, the rules you might want to follow, and the things you better avoid doing in Palermo. We help you to make your trip smooth and easy, with no unexpected surprises.